Watford striker Troy Deeney believes that Liverpool centre-back Virgil Van Dijk is the best defender in the Premier League. 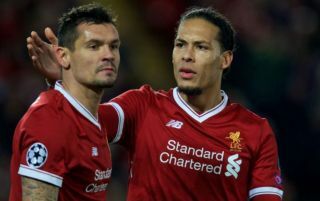 Since moving to Anfield from Southampton in January, Van Dijk has enhanced his reputation as one of the most assured and commanding defenders in European football, adding an extra dimension to Liverpool’s starting XI which has seen them concede just one goal at the start of the new season. The Dutchman already has 26 appearances for the Reds under his belt and in the club’s opening four matches of the new campaign, he has been ever-present alongside Joe Gomez in the heart of the defence. In previous years, Liverpool have had real issues at the back which have ultimately scuppered their hopes of mounting a realistic challenge for the Premier League title. However, with Van Dijk marshalling the defence and leading by example, Jurgen Klopp seems to have finally found the missing link the team had been missing, as their early season form is proving. Wins against West Ham, Crystal Palace, Brighton and Leicester City have propelled Klopp’s men to the top of the table and with Tottenham next up on Saturday, they have a real opportunity to nail down their title credentials. According to Yahoo Sport, Deeney, who plays up front for the Watford side who have also made a 100% start to the campaign, has played against Van Dijk a few times and insists that he is one of the few defenders that he has trouble dealing with, as he told reporters on Friday: “I always think Van Dijk is the best around. I said it this year; I said it last year. “Because he is a nightmare for someone like me. He’s 6ft4in, I think, and I’m just about 6ft. He’s big, he’s strong, he’s fast. He can play. Spurs will be the toughest test Liverpool have faced so far this year but with Van Dijk leading the back-four, there is every chance that the team can shut out Mauricio Pochettino’s talented side and steal a goal or two at the other end with the plethora of attacking superstars at their disposal.